Why are Tiffany Lamps So Sought After? The craft and artistry of these lamps is not the only thing which makes them so highly praised. History and reputation play a part in value as well. The original Tiffany company had such a high reputation for art and quality that they were commissioned to help design stage lighting for New York’s famous Lyceum Theater, which became the first to have electric lighting. Not to mention this company later decorated rooms in the White House and in wealthy homes in the Northeast. 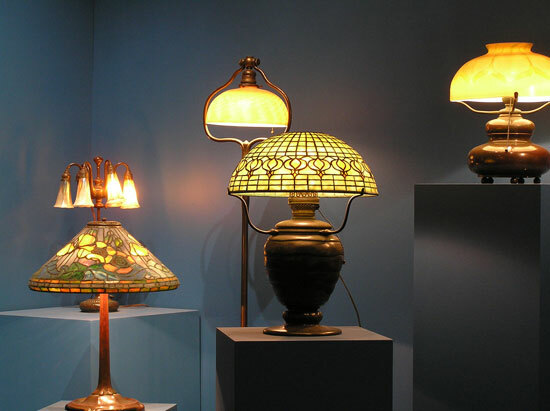 Considering these lamps were only crafted from around 1900 to 1928, the rarity of these exclusive art forms contributes to the value of Tiffany lamps. The beauty and skill with which lamps were made sets a high standard for decorative lamps, often ornately festooned with scenes of flowers, exotic birds, or simply a creative arrangement of geometric shapes. Tiffany lamps can usually be grouped into one of seven categories based on the shape or pattern of the shade. Different types of glass and patterns include: favrile, geometric, cone shaped, floral, globe shaped, irregular lower border, or irregular upper and lower border. But How Do I Know This Lamp is Tiffany? Knock on the lamp shade. Gently! A rattle can indicate a real Tiffany due to the breakdown of wax which holds the glass pieces together. This is an indication of age, since the wax dries out as it gets older. Any authentic Tiffany lamp is a fairly old piece. Take a close look at the glass. Confetti glass (glass with different colors in one piece of glass) or very bright or deep colors were often used by the original Tiffany company. That means if you’re looking at really dull colors or glass which has been simply painted, you’re likely looking at a reproduction. Look for the label. Also referred to as the “stamp,” the original Tiffany company usually stamped “Tiffany Studios New York” or “Tiffany Furnaces.” But since this label is easy to copy, don’t rely on this only. Also remember that the exclusive jewelry store “Tiffany & Co.” is not the same. Check out the base. Real Tiffany lamps were made with bronze, and on occasion pottery. Other metals or substances are likely to prove to be a replica. Don’t know what bronze looks like? Look for a yellow or golden hue to the metal. You can also tap it gently with a pencil. If you hear a very clear ringing tone, it’s likely bronze. Other metals likely produce dull tones or non-ringing sounds. Finally, if a magnet sticks to it, it’s probably iron or steel. Inspect your socket. The light sockets of real Tiffany lamps often used a turn-paddle socket (just like it sounds—looks like a square paddle jammed into the socket, which you turn). On occasion, pull chains and base switches were used, but not as often as the turn paddle. A Tiffany lamp with a socket replacement is always possible, but this will affect the value. Consider the source. Where did you find it? Research shows that most who find an authentic Tiffany piece inherit it from a family member. If you find it somewhere else, ask the seller who had possession of it. A long-time owner would be more likely to have a real Tiffany lamp, as opposed to something which has been passed around among many owners. Identifying a genuine Tiffany lamp may seem complicated, but all properties point toward the story of being specifically designed and hand crafted. This lamp is a classic antique and can be sold for high amounts of money, depending on the piece. Remember, these lamps were not machine-produced or even mass-produced. From its cone or globe-shaped shade to the bronze base, this stunning work of art is a great find for anyone!